LOS ANGELES – Tonight’s game was a project directed and produced by Boogie Down Productions. It didn’t feature the likes of legendary hip-hop artists KRS-One, D-Nice, and DJ Scott La Rock (the members of Boogie Down Productions), but it did feature the debut of DeMarcus “Boogie” Cousins. If not an explosive enough event on its own, it was met with an all-time great halftime performance from Compton native Coolio. Cousins fouled out in 15 minutes, but put on a memorable performance on an odd night in which the Warriors beat the Clippers 112-94. First things first; DeMarcus Cousins just returned from one of the most difficult injuries a human person can physically recover from, let alone one who weighs upwards of 269 pounds (his listed weight). Cousins picked up three fouls in three minutes tonight, and three more later, to foul out. That’s the bad. He was caught on his back foot on occasion and wasn’t always fluid in the Warriors’ offense, which isolated Cousins to try and get him points on the first two possessions of the game, to no avail. 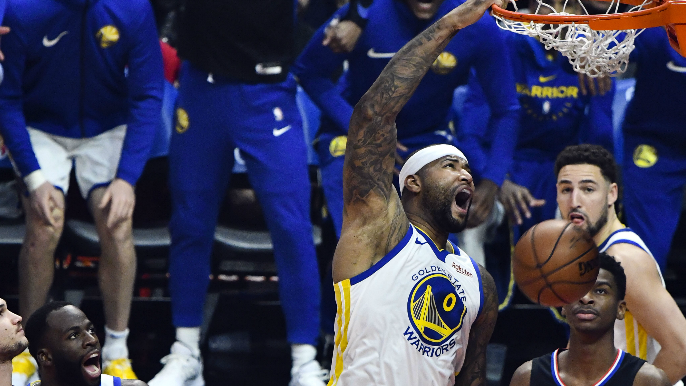 Cousins set a screen for Kevin Durant and rolled off it into a wide-open lane, which he exploited and slammed down the monstrous dunk shown above. Later in the game, he was able to draw two defenders in the post, spin out of coverage and draw a foul on a near and-one play. And of course, he also hit three threes, TWO of which were back-to-back. By no stretch of the imagination was Cousins where he was at last season, but anyone expecting that has no comprehension of basketball. The fact that Cousins is back and drawing attention, demonstrating that he can still score the ball and rebound effectively. He provides the physical interior presence that the Warriors have been missing since Damian Jones tore his pectoral, and if Cousins does what he did tonight, every night, that’s more than enough for the Warriors. In his hilariously brief 15 minutes, Cousins managed to drop 14 points (5-of-11, 3-of-4 from 3-pt), 6 rebounds, 3 assists, 1 steal and 1 block. To you math wizards out there, that’s a 30-minute average of 28 points (10-of-22, 6-of-8 from 3-pt), 12 rebounds, 6 assists, 2 steals and 2 blocks. Except, Cousins will continue to improve. This is as rusty as he will be all season, and he still looked very good. To anyone expecting more, I suggest you play NBA 2K. The context to DeMarcus Cousins’ return is not simple. Cousins went from having arguably the best season of his career last year with a pending free agency and an almost certain max contract coming his way. Then, he tore his Achilles. With a reputation as a hothead (Cousins is top-three along with Green and Russell Westbrook in recent seasons) along with a potentially devastating injury, Cousins faced the reality that the money that was sure to come his way was gone. He couldn’t find the long-term deal he wanted and chose to sign with the Warriors. But, if he doesn’t win with the Warriors, continues to pick up technicals or demands the ball in a way that works as a detriment to the Warriors’ already more than capable lineup, it would be a massive problem career-wise. As Coolio, who performed at halftime (more on that in a sec) rapped on “Gangsta’s Paradise,” “Look at the situation they got me facin.” The only option for Cousins was to grind incredibly hard and adjust his expectations and role to fit in with the Warriors. It’s game one, with many more to play, but Cousins overcame a massive hurdle tonight and seems well-loved by his teammates. If he can change the way he’s viewed by NBA front offices this season, Cousins has a chance at getting that long-term deal he wants this offseason and writing his name down as a player to win a championship in the NBA best-ever starting lineup. It would be legendary… almost as legendary as Coolio, who, after rapping “Gangsta’s Paradise,” at halftime, shouted out Corey Maggette, who was in attendance tonight. Maggette was a solid 16-point, 5 rebound and 2 assist player for his career, but the shoutout was both hilarious in how unexpected it was. Right at the end of the second quarter, Green picked up a second technical foul by hanging onto the rim after a dunk for an extended few seconds. That call has been a points of emphasis for referees in the past few seasons, and the NBA’s disdain for time wasting met up with Green for what looked like a technical foul that would see him ejected. Two technical fouls in one game equals an ejection, right? Usually. But Green’s foul was technically not an “unsportsmanlike” foul. According to Ben Golliver, the second technical foul was a “non-unsportsmanlike” foul, meaning Green was not ejected. It was a night chock full of technicals, yet Cousins, ironically enough, was not a guilty party in any of the calls. The first was called on Glenn Anton “Doc” Rivers. The Clippers’ head coach berated the head official well after a timeout for the first technical of the game, and in the third quarter, Kevin Durant was also called for one.